I should be at 11-4 overall. I submitted my picks each week and went 5-0, 2-3, and 4-1. Check the results in the threads. I'd like to be 11-4 too please. Make it so. Tough week to pick this week. I decided to go with ELO for all my picks, except Atlanta-Minny. I just can't see Atlanta losing this one, Bridgewater or no Bridgewater. Yeah ... and he isn't broken yet. If this is the year he makes all 16 games I'm gonna be pissed. Their defense would be dead last if not for Patrick Peterson shutting down the opposition. Dallas @ St. Louis. Ugh. Seriously, can we get a Jags game to pick? NO ONE. I AM PICKING NO ONE AND DON'T CARE THAT I GET NO POINTS FOR DOING SO. THIS IS A PROTEST! Baltimore @ Cleveland. Gotta go with the homer pick here in Baltimore. This may be closer than history tells us it should be. San Francisco @ Arizona. Patrick Peterson for the win. Arizona. Denver @ Seattle. Oh man. Seattle at home. Gotta play those odds regardless of who is coming to town. Chicago @ NY Jets. The Jets have been competitive running Chris Ivory. CHRIS IVORY! I like Chicago and their Who You Gonna Cover set of receivers better though. Well garrion got his wish from last week. He never filled out the form, so he actually gets no pick for Dallas/St Louis game, and goes 4-1. I wish SF had won last week's game.. as it stands now I had this game as a loss for the Eagles anyway..but I would have still rather played SF coming off a win.. since this is about as a "must win" game for SF you can have in week 4. Thanks! My protest still stands. Still no Jags game, gonna have to protest again. Good week of picks this week. Of course, any time I get to pick Green Bay over Chicago is a good week. Green Bay @ Chicago: Shootout! Green Bay needs some luck to go their way with their perennially injured OL. Philadelphia @ San Francisco: San Fran has to win one of these days. Why not this one?!? Buffalo @ Houston: Buffalo. They won't start losing until week 6. New England @ Kansas City: KC is still tough at home, right? Don't protest. Vote for Teddy! Heh. Stevie Johnson takes to Twitter, urging people to score points for his "fantasy work team". Hopefully he didn't draft me, since I'm on here at work. The best is the TPS report and he responds with a Lumbergh. 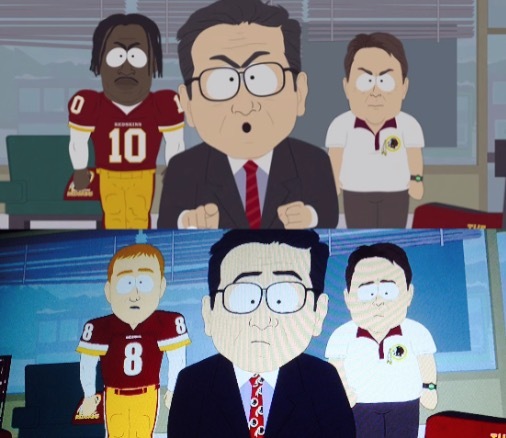 South Park's treatment of the Washington football team, the NFL, and Goodell (and Kickstarter and startup culture) was spot on. Even better, between the airing of the promo and the actual episode, they re-animated it to replace RG3 with Kirk Cousins. No real interest other than hoping Legion's Curse of the Moldy Hobos keeps the SF 49ers of Santa Clara winless at "home". Do you think Grantland could have found a byline picture for Bill Barnwell that makes him look more schlubby? Don't forget that this is the Panthers' week to play at Baltimore. I love Steve Smith, but I want his stat line to be 2-18 this week. Unfortunately for Carolina, if anyone can will his way to a 10-210-2 TD week, it's Smitty. I'm hearing a lot of "Washington" during tonight's game. I see him being the big fantasy pick-up next week. Eli threw three of something in the first half! Now this is against the Redskins but the Giants are looking really damn good here. OK, who the **** is this team in white?!?! And who is the guy wearing Manning's jersey? And none of them to a player I own in Fantasy Football. And I own 3 different Giants between my 3 teams. I'll bet Coughlin promised him he could get whatever ice cream he wanted on the way home if he played well. It was thrown directly to Prince Amukamara. In other news, this MIGHT be reversed for a TD. Not sure it is enough to change it though.